Peugeot has launched the RCZ R at the Goodwoood Festival of Speed. The ‘R’ will be the most powerful road-going car ever built by Peugeot, with 273PS and an electronically limited top speed of 155mph. The flagship model will go on sale in early 2014 and prices are expected to be in the region of £30,000. The RCZ R was first seen as a concept at last year’s Paris Motor Show and follows hot on the heels of the 208 GTI. The ‘R’ will use the same four-cylinder powerplant as the GTI, but feature aluminium pistons that are graded from the same material as those used in F1 engines. The 1.6-litre THP turbo unit will produce 273PS at 6000rpm, offering a maximum torque of 330Nm. Top speed will be limited to 155mph and the 0-62mph dash will take less than six-seconds. 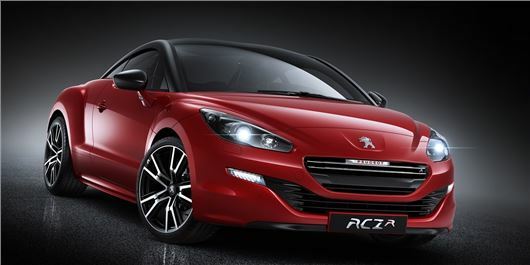 Peugeot has also trimmed the car’s weight, making the ‘R’ 17kg lighter than the standard RCZ. Chassis improvements include a Torsen front differential, which transfers power across the front axle to reduce torque steer, and a 10mm reduction in ride height. Peugeot has also enlarged the rear spoiler and reworked the rear diffuser to improve airflow under the car. The interior will feature a pair of bespoke leather sports seats, brushed aluminium plates and a smaller steering wheel to improve comfort. It will be available in four colours - Moroccan Red, Nera Black, Mercury Grey and Opal White – and be offered with a range of options, which include satin or gloss carbon roof treatments, decal designs and black mirror shells.